How to Write Change of Ownership Announcement Letter? Before you hand over the reins of your business to a new owner, such as in a company buyout or to a succeeding family member and before you make any announcements about the transition you’ll want to plan ahead and tread carefully. A Change of Ownership Announcement Letter is a merely a formal announcement to all the faithful and devoted customers/employees that the owners of the company are going to waive the ownership to some other person/body. To put it straightforwardly, it is going to be owned by someone else/body henceforth. Such announcement letters can be used for reputed and huge firms/companies or business. Introduce the new owners at the formal announcement meeting, if possible, and provide all employees with as much information as possible about the new owners and their goals for the company. It can either be a change in ownership or management. The letter may include a few important details about the new owner of the new owner’s name, qualification, experience and contact information. Disclosure of details other than these basic ones entirely depends upon the company’s policy and decision-making panel. The Change of Ownership Announcement Letter should include relevant details like changes in the existing contracts and renovation of policies. It must briefly include the history of the new owner, work background, experience, qualification and USP to run the business without endangering its smooth functioning. Also, don’t forget to disclose the details regarding the financial statement and records of the old company for transparency. For customer/employee trust and satisfaction, disclose the actual reason for the change in ownership. This will help to maintain the relationship. Subject: Change of Ownership Announcement Letter. We want to bring to your notice and announce that our firm, (name of the Existing Firm) located at (Address of the Firm) is being transferred to the new owner (Name of the New-Owner). The firm was co-owned by (Name of the Existing Co-Owners), (Position of the Existing Co-Owners in the Firm). (Describe in your own words). 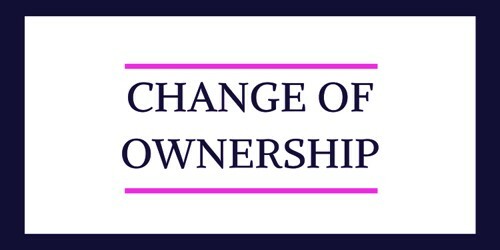 The change in the ownership would be effective from (Date from which the Ownership of the new owner will be effective). We intend to notify you, through this letter, that there is no change in the management and policies of the store. We make certain you that we are going to sustain the repute and standing that we have managed to build for over (Number of years of firm’s existence), by assuring you that the (Propose the plans). (Explain the actual cause and situation). We had to take the step of changing the ownership of the firm because (Mention the reason) but we ensure you that (Name of the New Owner) would handle the store with his/her (Qualities/Experience possessed by the New Owner). (Cordially Describe your requirements). You have always been our valued client and have trusted us from the very beginning and also in all the odds for which we are very thankful and grateful to you. Expecting to seek the same shortly.